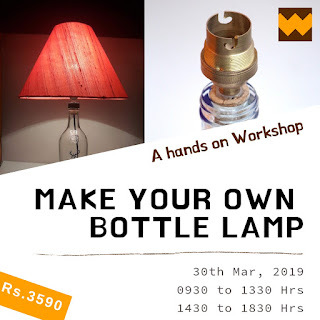 Me being drawn to DIY and Preethi to home decoration, it has been quite a challenge for us to choose between DIY and buy for sprucing up the home. Either way, we have had some good times picking up things for the home. It has not been difficult for me to be enticed by home decoration which made it all the more easy for the two of us in our decisions. Fluidity is what best describes our décor tastes and the way we are moving from one style to another is testament to that description. When we first started building the home immediately after we moved in, we had our eyes set on contemporary styling. The box type sofas, along with the accents of red and orange helped create an environment for lively conversation and happy times. But then, we got bored and so started our journey to bring in a complete transformation into our living space. Since our wedding, we have been to Kerala umpteen number of times. Munnar, Thekaday, Wayanad, Kumarokom to name a few. Maybe the recent change in taste is an influence of all those visits. Antique is the new contemporary, or so we thought. We wanted the décor elements to have a story behind them. Be conversation starters. And help in reflecting our personality. 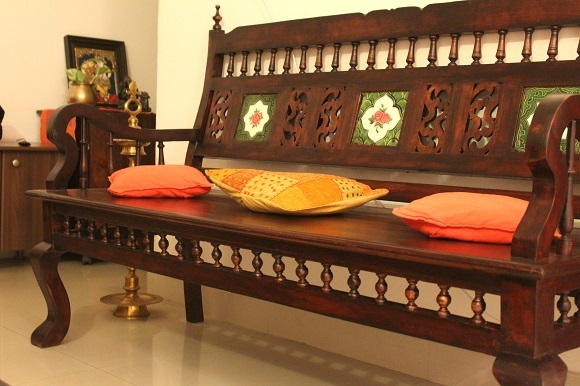 The teak wood sofa with its athangudi touch, and the rose wood trunk that came all the way from Kumarakom, always help us recount the good Kerala times. The Bharani (Jar) that comes from my mother, and the copper vessels that were passed on to Preethi have vintage written all over them. They come with family history behind them and trigger wonderful memories. 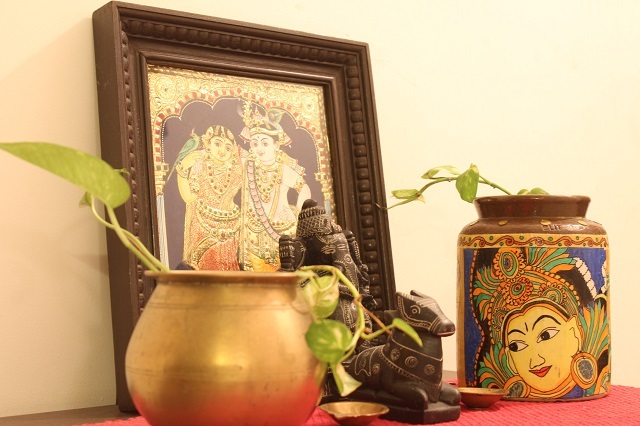 The Bharani and the copper vessels serve as lovely vignettes in the two corners of the room. The paintings, the accent lighting, the center and side tables mirror the love we have for making our own things. Imagine our joy when faced with the, “Where did you buy that”, question ! DIY Décor has indeed helped create an identity for us. But wait, there is more. We added wooden wall brackets and hung a lovely peacock diya. And there is more too, but all in the pipeline. Some approved, some not approved. Our balcony is attached to the living room and at present does not have a nice seating area. I am thinking a mini thinnai made in concrete and redoxide for the balcony. That is the sneak peek into our living space. We take our time with decor. Do one thing at a time. 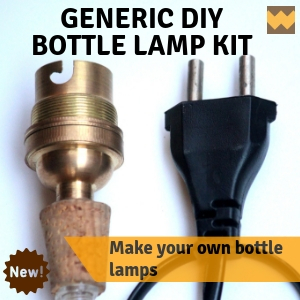 And we want it to speak volumes about our passion – Both for DIY and for home decoration. We hand pick everything. No impulse buys. We give it our personal touches. We want it to have a past that we can look back at and relish. And when that guest, while casually sipping his / her cup of hot chai, utters that “WOW, you guys have done it up well”, we know that our efforts make sense to others too. And that is enough to make our day. I am nominated under five categories at the Asian Paints Indian Décor Influencer Awards. Social Samosa along with Asian Paints opens the gates for the first ever India’s Décor Influencer Awards (#IDIA, #IDIAwards) – an initiative sculpted to accost the contribution of influencers in the digital hemisphere. And this post was my attempt to show the world how this blogger's space looks. Hope you liked reading as much as I loved writing it. Sincere apologies for not getting back on how our living room make over is progressing (Read about the BEFORE and AFTER-PART 1 posts before you proceed). Our daughter has kept us on our toes and we are busy baby proofing every single item in the house. 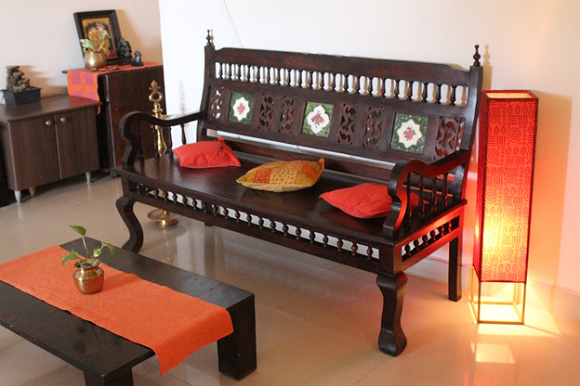 From the time we published our earlier post, we have added a few things to give our living room the traditional South Indian feel. 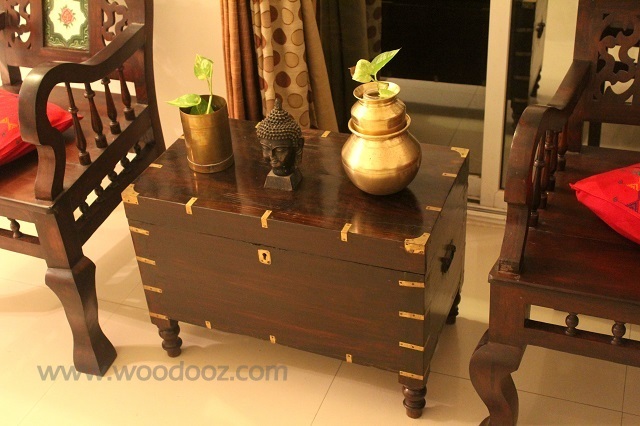 A wooden trunk, restored from an antique wooden trunk- We got this shipped from an antique dealer in Kottayam, Kerala. Thanks to a friend, a native of Kottayam for giving us his contact (for those interested in knowing about this seller, please email us). Apparently in the olden days, wooden trunks were used by ‘chettiars’ as a dowry chest and is gifted to the bride during her wedding. 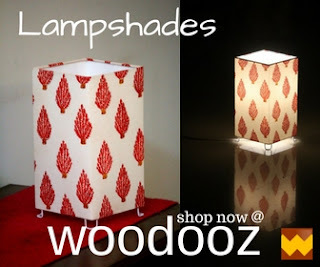 It is normally made using rosewood or Burma teak to showcase the extravaganza. 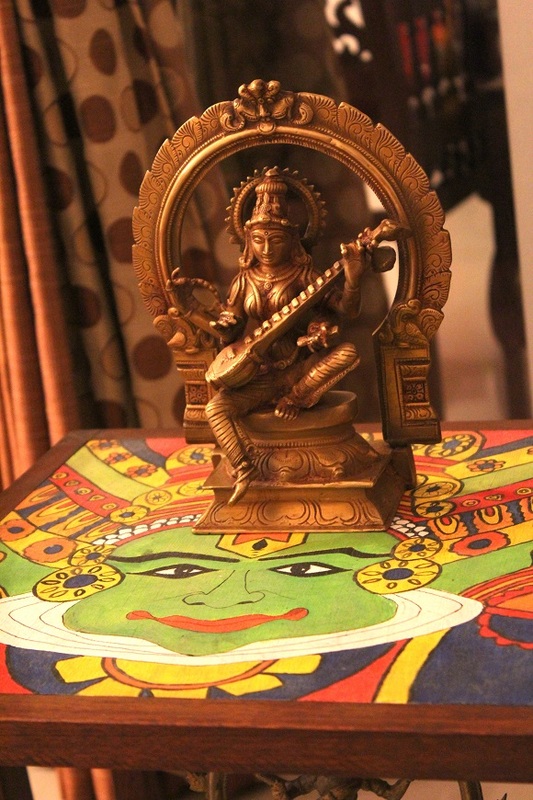 This one is made of rose wood and has brass pieces embedded on it to further adorn it. It fits in nicely as a side table in my living room. I added some brass pots (called ‘padi’ in Tamizh and was used to measure grains in the olden days) on them. 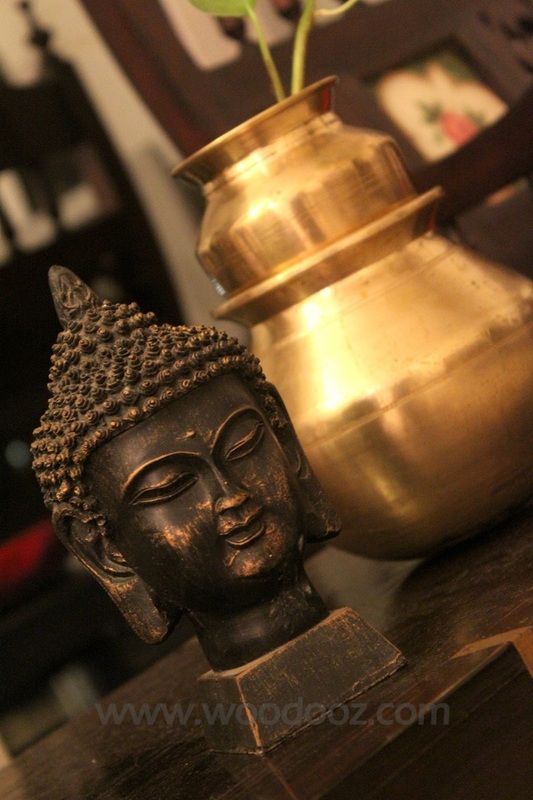 My ever favorite Buddha piece rests nicely on it (Now don’t ask me how Buddha adds to the Kerala/ Chettinad interiors). I just love the serenity it brings to our home. A Kerala mural is also in progress and I will post the pictures of it once it is complete. We also added wooden wall brackets to hang our peacock diya. 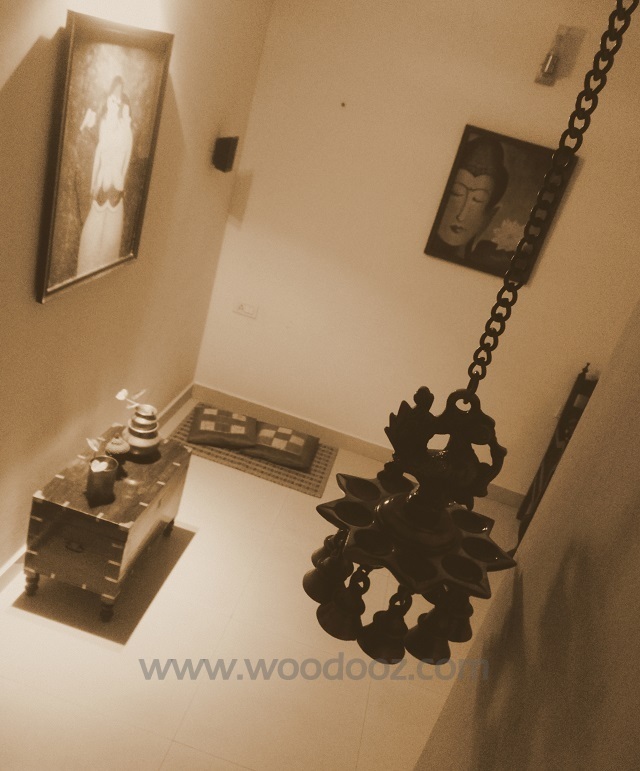 The wall brackets are made of teak wood and I got it from Kraftome in Coimbatore. They were reasonably priced and of good quality. They may be a bit small to be hung near the roof. But I am ok with the current look until I find bigger ones for a reasonable price. 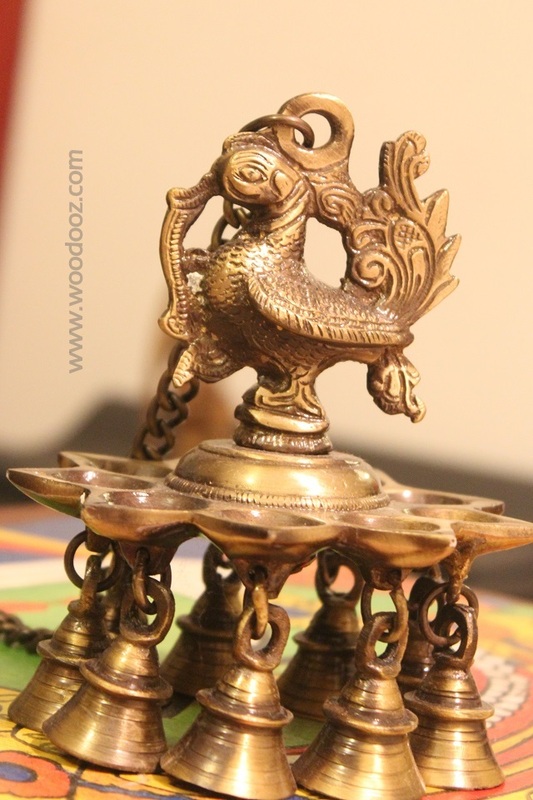 The peacock hanging diya is made of brass and was purchased online. I gave it an antique polish to give it the desired feel. Note : Could not capture the photo of the brackets as we could not get a good composition at that height. 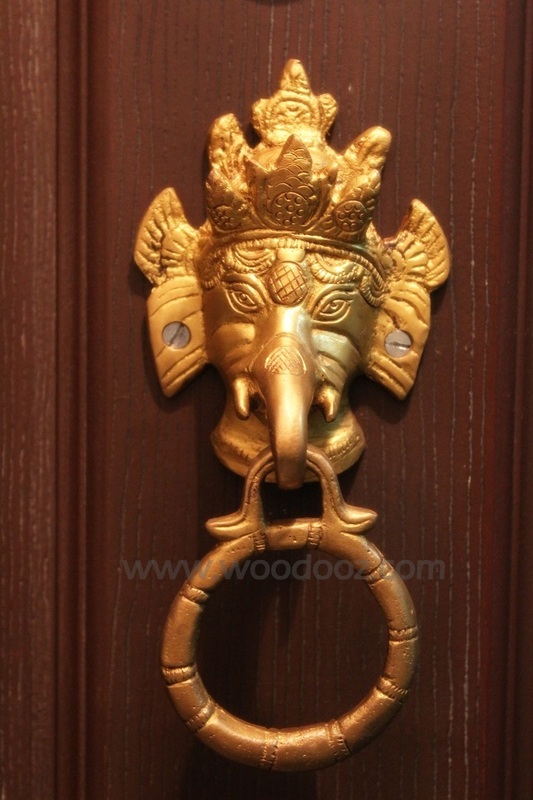 Finally we fixed a Ganesha brass door knocker. It serves two purpose. One, it forces our guests to use the knocker instead of the bell (with a baby around, a door knocker is better than a loud gong). Two, I think it adds a native touch to our entrance door. We are taking things slow. I am exploring laying athangudi tiles as the border for our floor. We will update about it in the next post. Please let us know what you think of the progress. You all would have seen our mini home tour a while back. It has been six years since we moved in to this home. We decided to have a make-over. We started with our living room. Here is an update on our living room make over. 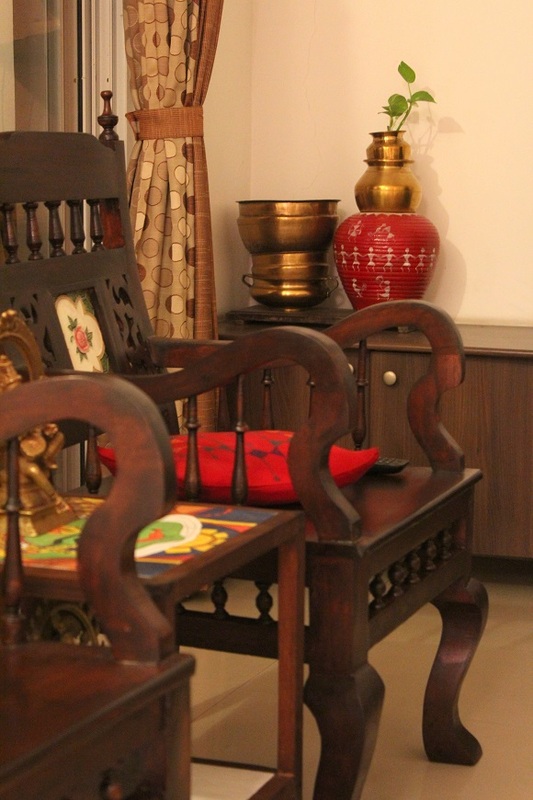 I have always been fascinated with traditional south Indian interiors with thatched roof, red oxide flooring, vibrant colors and antique wooden furniture. 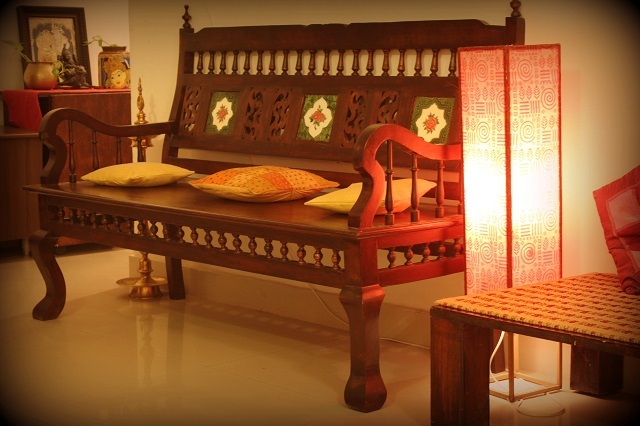 Be it the chettinad style or the traditional Kerala interiors, they have an old world charm to it. We wanted to bring some of its essence to our own place. It is still in progress… With a budget in mind we are slowly collecting stuff from different parts of South India that could be arranged to get the feel we want. We also have our baby now (yes, she has been keeping us busy.. reason why our posts here have been sporadic ) so we want to have the space kids friendly too. To begin with, we parted with our old sofa and hunted for an antique teak wood sofa. We visited several antique stores in the city and finally found a model to our liking. We had our furniture maker (ACC Woods, ECR, Chennai) stick athangudi tiles to the back rest to give it a traditional chettinad look. We are also on the lookout for old restored furniture so that we limit the use of fresh wood. Our home gets a lot of natural light which gives us a lot of room to play with colors. For now we stick to our favorite reds, yellows and orange. We got some brass items- Saraswati sculpture from my aunt, picked up Nataraja from a handloom exhibition in Chennai, brass hanging Peacock Diya with bells and brass Ganesha door knocker for the main door online. They came with antique polish which will save up on my effort. We also have our grandmother’s brass items that will add to its charm and rich ness. As we are still planning the layout, it would be good to have a list of things charted out to get the final desired feel. Do you have any suggestions ? Leave me a comment. 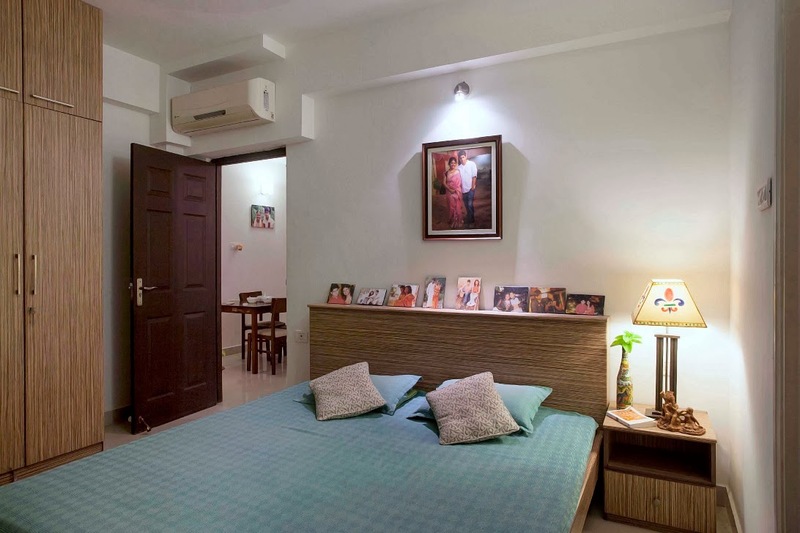 A long pending post and finally I get to take you through a portion of our home. The saying “home is where heart is” is so apt as Somu and I spend a lot of time at home - in front of the TV, in the balcony, in our kitchen and just about any corner of the house. Since this was our first home, we gave it a lot of thought, love and care before doing up every piece of it. I still recollect the umpteen number of store visits and countless arguments before we had to choose the color theme, the mood and the accessories that brought life to our little abode. During the time we spent on making our home, we discovered some interesting things about ourselves - our tastes, our love for art and how we longed to personalize everything in the house. Today, as I write this post, it is such a pleasure to look back, remember and cherish every moment of it. Here are some pictures of our home that speaks a million things about us. Take a glimpse of the walls and every object, each having a happy story to tell. 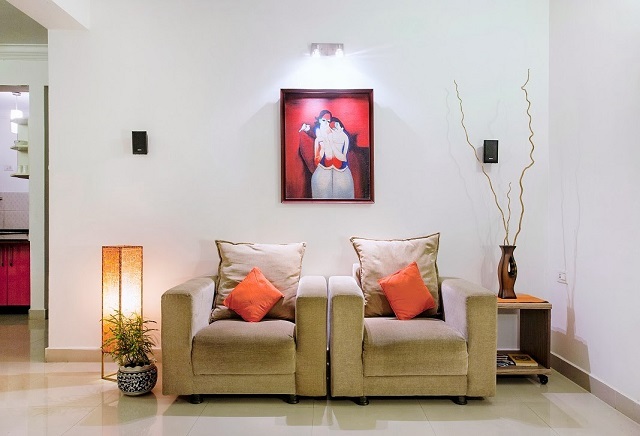 The living room mostly has accents of red, orange or yellow which are supposed to create an environment for lively conversations and happy times. 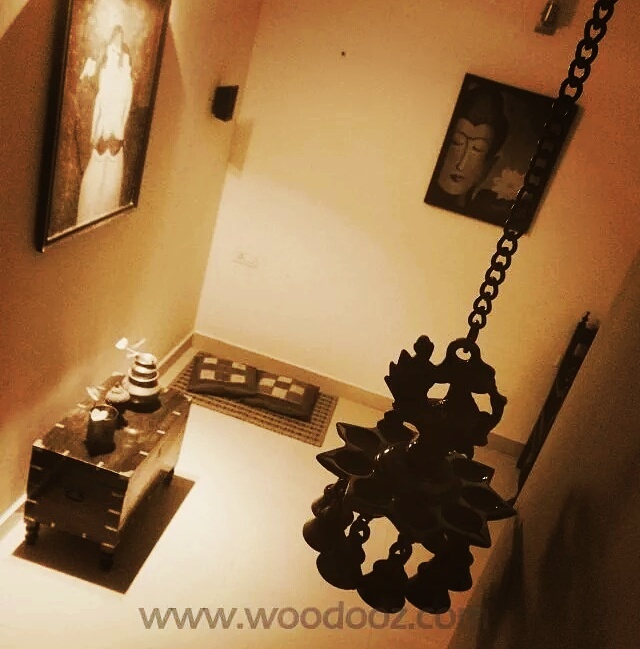 We wanted to have a Buddha sculpture and went with a painting to give it a serene look. The couples painting, the center table and the lamp shade were all added to match with the color theme of the room. My kitchen is my own space and is the place where I spend maximum time. The decision that took the most time was the selection of colors for the kitchen. And despite all the conventional choices thrown at our face, we went ahead with real bold colors. I have this unusual craze for reds and my friends would relate better to that obsession of mine. Proud that it even made through the nominee list of Apartment Therapy's small kitchen content. Notice how we had the cot and side table customized to match the wardrobe in the room ? This was one time that we decided that buying off the shelf does not make sense all the time. And that’s about what I wanted to show for the moment. 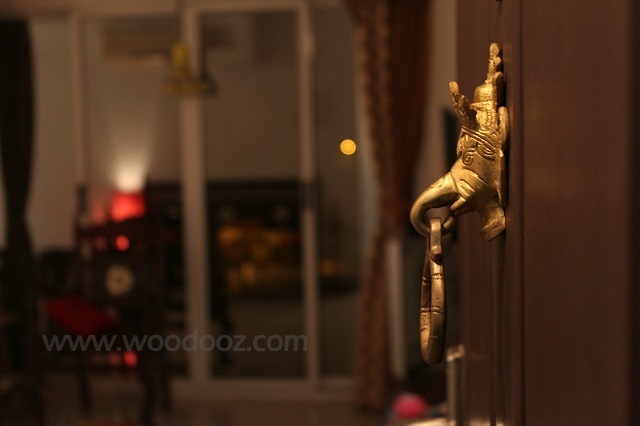 Every room has some stamp of our DIY and we take immense pride in showing them off to every visiting guest  I still have to put up the images of the foyer, the balcony and some of my favorite nooks and corners of the home. But then I will save it for part-II and for another day. Meanwhile, do leave me a comment. Would certainly love to know your feedback. 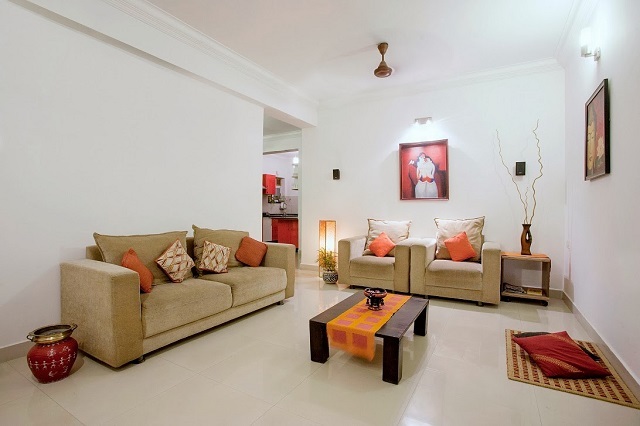 "All Photographs by Architectural Photography Chennai." I did write a little about how Google Sketchup is a wonderful, easy to use free tool for furniture designing. With Google introducing the ability to embed models using html (Visit our Gallery), I thought it deserved a much detailed post. 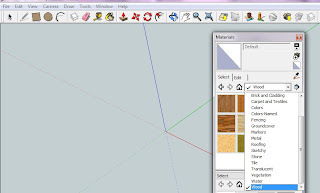 Sketchup is a freely downloadable application for creating 3D models and has a simple to understand interface. The interface comes with a patented push and pull technology which makes creation of 3 dimensional images a cakewalk. Quoting Wiki, “Images can be created in 2D and these 2 dimensional planar faces can then be pushed or pulled by editing tools within the environment to easily and intuitively model 3D volumes and geometrics”. The interface also has the axes in place which makes drawing a certain line or an image along a particular axis much easier. Below are some practical uses for the Sketchup interface. The images below are embedded directly from my Google Sketchup warehouse - a feature that enables home decor and design bloggers to showcase their design work with a 3D perspective to their readers. You can rotate the images below along the Y-axis, and have a 180 degree view, while the Google Sketchup application allows for rotation along any which axis that you desire. Design the interior of a room (in our case a kitchen). Play around with cabinet / couch / table / draw / shelf etc... placements, especially when the piece of furniture is a permanent fixture and cannot be moved around. You want to do a feature wall and want to know how it will affect the overall look ? This is a tool for you. 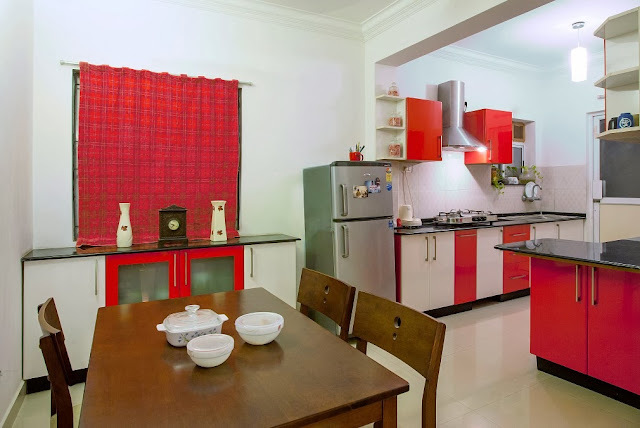 Take a moment to let us know how the image looks in comparison to the actual red and while kitchen below. Provide the end user with a 3D visual of what you are building for him / her. It allows for discussion and enables the user to modify any aspect of the design that he / she may not like. The user can also give his stamp of approval of the design and any contention at a later stage on the end result can be amicably handled. Convert the approved design into a 3D skeletal view. This is more so useful to understand the number of planks required and at what dimensions. This allows for estimating raw material required and for evaluating cost. Also to understand where additional reinforcements, in terms of screws and glue, are required. These are only some of the uses that I have encountered for my personal requirements. However, this tool is extensively used in automobile design, architecture, interior designing, etc... with an ability to contribute and share your models with friends. The 3D warehouse also has a load of models from other designers that can be downloaded and modified per your requirements. The options are limitless and I have listed only a very limited aspect of it. Certainly an alternative tool to Autocad. Try it out. It is bound to be lot of fun. How do you plan your designs before implementing them? Be it decorating your room, or building a piece of furniture, do you visualize what you want and how you want through an interface besides your mind ? Or do you love the traditional way of capturing your visuals in a paper ? P.S. I also intend to provide a detailed DIY tutorial of this center table and this garden corner shelf using the Google Sketchup tool. Be back for more or just stay in touch through our FACEBOOK FAN PAGE.